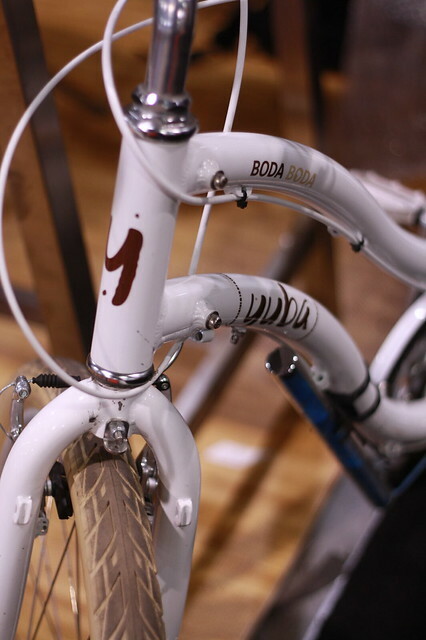 Cargo bike company Yuba came out with a new model called the Boda Boda. 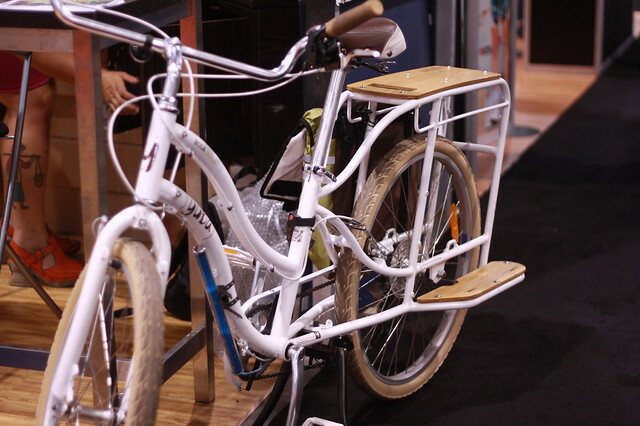 This beautifully designed cargo bike has to be one of the most handsome cargo bikes on the floor at Interbike. I love the white paint with the walnut colored wood trim. Dual kick stand for extra stability. 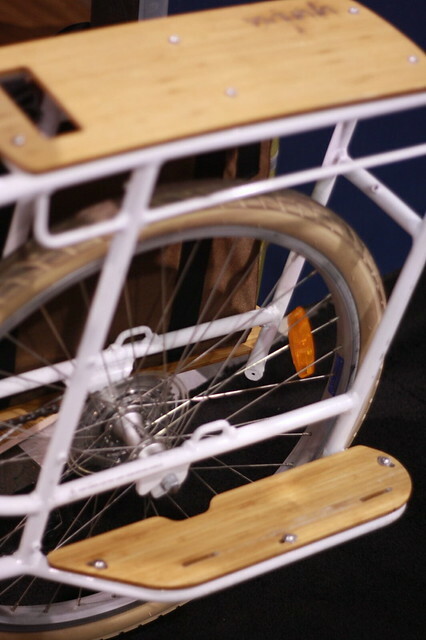 Overall, my favorite cargo bike at Interbike. One of my family’s favorite activities to do together is riding our bikes. My girls love an afternoon roll to a local park. One of my daughters (in the white) absolutely loves the Torker Cargo T. Before we started, she asked if she could ride the beast of burden. Of course I let her besides, I wanted to get pictures of the bike in motion. I know that my other daughter is on the sidewalk…she was being rebellious that day and believe me when I say that she was grounded for riding on it. Breanna is only 11 years old and thanks to my love for bikes, has grown an appreciation for quality bicycles. Every time the Torker Cargo T is out of the garage, Breanna is ALWAYS asking me if she could ride it. Torker Cargo T: How tough is it? Pretty darn tough if you ask me. I knew from the moment I laid eyes on the Cargo T, that this beast was going to be one bad mama jamma. With that in mind, I wanted to see how well a commuter cargo bike would handle off road trails. I headed out to the Fullerton Loop, a mild mountain bike trail that I frequent, and decided to see how well the Cargo T would handle coming down a rutty trail. Coaster and roller brakes worked just fine. I also added a little accessory…I just have to clean up the wires a bit. I’m still undecided on what to do with the front rack. I can either install a wicker basket, a metal basket or a milk crate. For the rear rack, I am sticking to my panniers. I understand that most of you that would use the Cargo T probably won’t use the bike for mountain biking, but at least you know that the bike can handle rough terrain. Well, I’ve been riding my Bilenky every day since I got it and have put on at least 300 miles on it. Enough, I think to write a review of its performance on the short term. Needless to say, I’ve already taken a few chunks of paint out of it so it’s getting used. However, it does hurt a little to see the pretty bits of orange flake off. Out of the box, the Bilenky isn’t going to carry a whole lot (unless what you’re carrying happens to be larger than the dimensions of the front rack). This is where something like the Xtracycle shines with it’s bags, which I think are some of the most well-designed pieces of carrying luggage ever invented. In the pics above, I’ve used some electrical tape and old tubes to help cover the paint, but to also create a more tacky surface for loads on the rack. 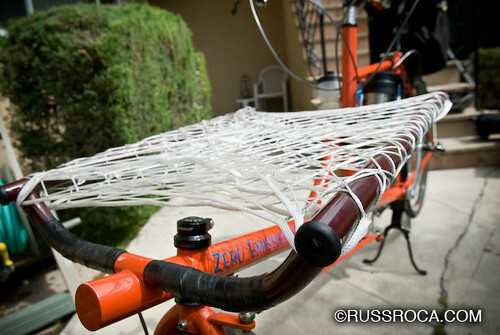 In this pic, I’ve wrapped some 2 foot wide marine safety netting around the rack. It goes around the rack about four times and acts as a soft bottom sling. This stuff is actually pretty cool. Very light weight, sturdy and I can adjust the tension of the surface by either making the wrap really tight or loose. I can also slip things in between the layers. Granted, this wouldn’t carry a fistful of nickles, but for everything else it works great. I’m working on creating a new sling made out of Cordura with adjustable cam straps so it doesn’t look like Spiderman pooped on the front of my bike. Here’s a shot of my tripod and a canvas wrap containing a lightstand, umbrella and softbox. They are a bit longer than the rack and perfectly under the sling. On top of that goes my Pelican case, all of it held together with some nice strong tie-downs. The view from the cockpit when the bars are turned. Notice you can’t see the front wheel at all. The first question I get asked is, “Is it weird riding that thing?” Yes. Like any new bike, the handling characteristics are unfamiliar. I can say, however, after 300 miles it’s second nature. It steers more like a Cadillac than a Porsche. 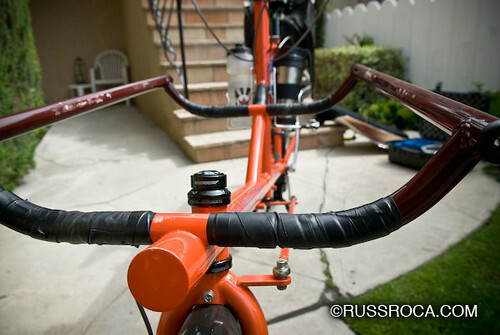 I find it is better to lean into turns than to twist the handlebars. It is a little disconcerting at first to turn the bars and not see a front wheel turn. You realize how much of a visual indicator the front wheel is for your steering. When unloaded, the front feels a little light and squirrelly. Once you get a load on front, the steering gets dampened and its a joy to ride. You feel like a ship’s captain. My biggest concern about the bike was that I wouldn’t be able to stand while climbing. I have found that this is not the case. Granted, I was wobbly the first week, but now I can climb sitting or standing without a problem. 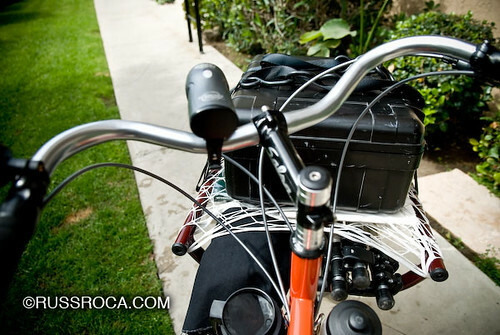 It’s actually easier than with the Xtracycle in some ways because the load on the Bilenky is always centered. With the Xtra, I found that I had to get the rear bags relatively evenly loaded to be able to climb well while standing. 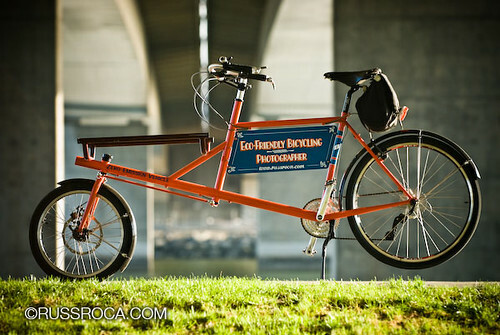 Why the Bilenky over an Xtracycle, Bakfiets, Long John? 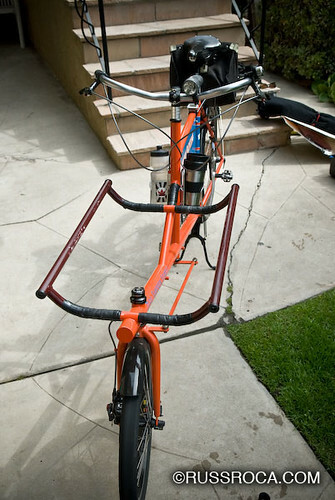 I prefer the Bilenky over the Xtracycle because there is no flex. The “boom tube” on the Bilenky is huge and really inspires confidence as to carrying large and heavy loads. 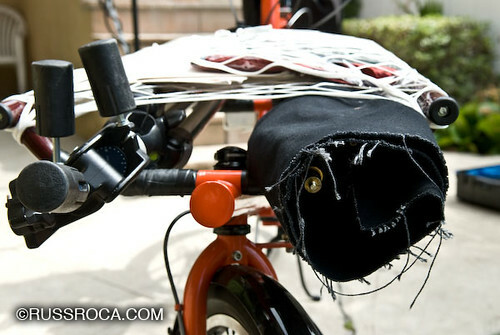 The Xtracycle wins in terms of the bags, but with some ingenuity the Bilenky can be modified with bags or a sling. I also find that I also like being able to watch my gear while riding. After doing standing climbs on both the Xtra and Bilenky, I prefer the Bilenky again for the lack of flex and also the fact that the load is always centered. Compared to a Bakfiets and LongJohn, I prefer the Bilenky for many reasons. One of them is weight. I think my Bilenky weighs in at about 45lbs. A Bakfiets with a box is about 90lbs. Not sure about the Long John, but I am almost positive it’s more than 45lbs. 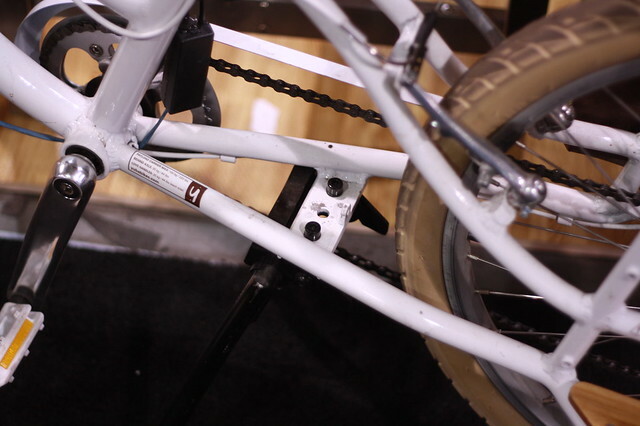 The Bilenky is also made to take a derailleur system (or can be customized to whatever you want). 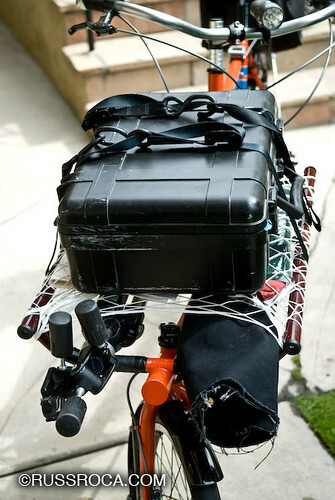 The Bakfiets is limited to an 8spd internal. Most Long Johns are 3spd. I think the biggest advantage of the Bilenky is the ride geometry. My setup is relatively upright but not Dutch upright and also allows me to stretch out by changing hand positioning. The Bakfiets and Long John, from what I have seen and read are pretty upright and can be a bit cramped. That’s it for now. I’ll write another review when I break a 1000 miles.